Updated: Time for the planned crash is at 5:28 PM EST. Modern-day space travel and launchings are more accessible to the global public than ever. These are very exciting times we are living in, aren't they? 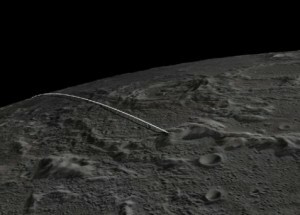 NASA will send its twin GRAIL moon probes into the side of a lunar mountain on Monday, December 17. NASA will livestream the event. Go to NASA's Live Streaming site to view the event. It is scheduled for 5:28 EST. While you are at the NASA Live Streaming site, I recommend bookmarking it and if you have an iPad/iPhone or Android device, download it there. We have learned so much by tuning into NASA feeds and listening to the commentary. You can also keep abreast of new projects being launched by NASA. NASA TV can also be viewed on YouTube and UStream.